2015 is long dead and gone and we are already well into 2016. As some of you may have already understood we have started working on new material. Everything is still in the early stages but we have some really cool stuff written already. We´ll keep you posted about our progress and hopefully this monster of an old school thrash metal album will be out by late autumn 2016! On the live front we are going to be playing at the Tallinn Music Week metal showcase and we can assure you we will wreck your necks and eradicate your livers! Other live activities are of course also planned but we can not announce some of those just yet. Let there be madness! Let there be Thrash! This year has been an awesome year for Thrashless, we had the privilidge of supporting the legendary Sepultura and now we are playing together with Hobbs Angel Of Death, another legendary underground thrash metal band. Joining us that evening we will also have Violentor and Jumalation and our friends in Ognemöt! I can assure you its going to be a crazy evening and you will regret it if you wont be there! Be There Or Be Sober! It is with great pleasure we can announce that we are officially supporting thrash metal titans Sepultura in our home country Estonia! We are beyond excited and hope to wreck all of your necks and livers with the masters themselves! Be there and show your support! The cult awaits! Thrashless is proud to announce that we are going to tour Russia in support of our album “Cult Of Fear” ! We are looking forward to meeting all of you crazy thrashers and just good old drunkards! We are already keeping our livers on ice in preparation! May your vodka forever remain frozen! Russia we are coming! On the 31st of January we played in Turku for a killer audiance with killer bands! It was an absolute pleasure to be there and we could not have ended this string of dates in Finland on a better note! For now we will let our livers regenerate and take pleasure in knowing that we have provided countless of hours of work for finnish chiropractors. We would like to thank all the bands we played with and all the promoters who made these dates possible for us! A Special thanks goes out to all the people who came out and supported us, without you guys this would not be possible. To all our new friends and old friends in Finland, we raise a glass in your honor! Thrashless shall return to Finland! Prepear your livers! Greetings maniacs! You can listen to our new full album “Cult Of Fear” right here! Listen to it and thrash your grandmothers place! As most people who have visited this site have noticed it has been eerily quiet, but no, we did not die of liver failure just yet. We have been locked away in the studio recording a new album which is now done and will be released on cd and vinyl. The album itself is titled “Cult Of Fear” and in typical Thrashless fashion contains 10 tracks of pure thrash metal. Musically it is the most varied and technically demanding album we have ever done. You´ll get a sample of whats to come soon enough! It is with great pleasure we can announce that we are playing Hard Rock Laager 2014 and it is an absolute honor to be a part of such an amazing line up of bands. We can assure you we will create a drunken thrash metal apocalypse and give extra work to the local chiropracticians. See all of you maniacs there! So here we are back from Poland, tired and broken and still recovering from our legendary Vodka Attacks. We would like to thank all the bands that we played with and ofcourse a very special thanks goes out to Terrordome for having us over and Reanimator for just being really cool guys. To each and every person who came out and supported us during our gigs, we thank you from the bottom of our hearts, it was an overall great experience and we hope to be back as soon as we can. Best wishes to all the new friends we made! After quite a bit of silence its time to let you all know whats happening again. Firstly a big thanks goes out to everybody who supported us at Tallinn Music Week, it was a great gig and you guys are what made it great. A Special thanks to all the bands who performed that evening. Now we are going to be playing at the Estonian Thrash Metal Club so called birthday party on the 18th of April, be there and support your local scene and bands! And so it has come to be that our second gig in Poland has been confirmed! On the 25th of April we will all find out that “Thrash Is Hell!”…Well, thats what the event is called at least. Looking forward to seeing everybody out there and supporting the Polish bands and ofcourse us, dont be a poser and support your local bands and scene! We´ll see you all out there somewhere. Still saving the world from excess alcohol…Hero Out! The plague known as Thrashless is yet again spreading, this time its stretching its ugly tentacles all the way to Poland! It is with great pleasure we can announce that we will be playing with Reanimator from Canada and our friends Terrordome from Poland! Posers of Poland better shake and shiver with fear because We Burn Your House! 2 weeks and 2 weekends spent in Finland. Starting from the beginning we would like to thank each and every person who came out and supported us at Riihimäki. It was a great evening and we had a blast. A special thanks to National Napalm Syndicate for having us over and allowing us to thrash! And now moving on to Lahti! As far as crowds go we probably didnt break any records there but it was a fun and quite intimate gig, we enjoyed ourselves and had a great time in general. To the people that were there, thank you for coming out and showing your support for us yet again, you guys make all of this worthwhile. A Special thank you goes out to our good friends in Soulwound for still wrecking their livers with us! Finland we shall return!…Be prepared. If there is anybody on the planet that can rival estonians in their legendary liver destruction it is of course the finnish. Thrashless will be playing a gig and doing some liver destruction with their good friends in SOULWOUND on the 31st of January at Motör Pub in Lahti, Finland! Join us all for an evening of thrashing and getting thrashed. It is with great pleasure to announce Thrashless is yet again headed back to Finland! On the 25th of January Thrashless will be playing with the legendary National Napalm Syndicate!!! It is going to be an absolutely amazing evening…be there and get thrashed!! So here we are, another year has passed and another has arrived…as of now the world still has not come to an end and due to that very unfortunate fact Thrashless shall continue with nothing more or nothing less than pure madness. We are very happy to announce that we´ll be playing our first gig this year at club Rockstars on the 11th of January 2014. We´re going to have our friends from Defeatem and Deformed shredding right along side us. Perhaps more people will join us so stay tuned for that! None the less we hope to see ALL of you there to get an awesome thrashing start to the year…! We are back from Finland and to sum things up…it was awesome!!!! We would like to thank everybody who showed up to support us and our good friends in Soulwound! A very special thanks goes out to the guys in Soulwound for having us over and and helping us destroy our livers, it was great!! Thrash till death, vodka attack till liver failures! Thrashless will be leaving for Finland in less than 48 hours to support the awesome guys in Soulwound who are having a release party for their new album! Be there or be dead! Thrashless got 2nd place with their video “Vodka Attack” on the national TV show Top7, a big thanks goes out to everybody who voted and we hope you´ll vote for us again right here. Thrashless is finally back 5300 km and 7 countries later! It has been an absolute blast for us all. We would firstly like to thank each and every person that came out to our shows and supported us…you guys make it all worth it! We would like to thank the organisers Traian Popescu and Victor Faraon of the romanian thrash metal festival for having us over and taking care of us, it was great and we will return! And a very special thanks goes out to Rudi and Radu in Moldova for all the “Vodka Attacks” and of course for having us over as headliners! It was amazing! A big Cheer to all the new friends we made, we are already looking forward to seeing you again! We are tired, but we are not slowing down, expect to hear from us again soon! Once more a big thank you to all the organizers and people who supported us! Long live the Vodka Attack! It has been quiet here for quite some time, so time to make some noise and let you know what’s going on. Thrashless will be heading out on a small tour to promote their new album “Trip Of Death” which we are presenting this Saturday at club Rockstars! We will then play a gig in Romania at the Romanian Thrash Metal Festival and then on the 13th of October we will be in Moldova meeting our old friends and hopefully making a lot of new friends! Looking forward to seeing you all out on the road!!! Thrash Till Death!! We are back from a very successful Caucasus tour!! It has been an unbelievable and crazy experience for us and we couldnt be any happier right now. We made alot of new friends and met some old friends and above all we got to see that thrash metal is alive and well in the caucasus with the craziest fans you could imagine! We would like to thank all the bands that we played with: Scratch The Floor, Dismorial, X-Machine, Infected Cinema, Daeron, Kill Them All and Signs. It was a pleasure to play with all of you guys and we´ll be seeing you again! We would also like to thank locomotive productions, Zuka, Arsen, Rudi and The Music Factory for making it possible for us to play there! The biggest thank you of all goes out to the people who came out for our concerts, you are what keeps us going and we are forever greatful for your support and love, in your honor Thrashless raises a beer, we shall return! More dates confirmed in the caucasus, we´ll see all of you thrashers on the road! Thrashless are psyched to announce that we will support Finnish thrash metal titans STONE in rock cafe on the 27th of february!! But there is more!! In march we´ll be headed to Armenia where we´ll be spreading the mosh disease that is thrash metal on the 16th!! The world wide invasion of Thrashless continues! We, Thrashless, are back from a successful invasion of Finland and would like to thank all the promoters,bands and above all the people who supported us while we were there. We had an absolute blast and we will definitely be back!!! 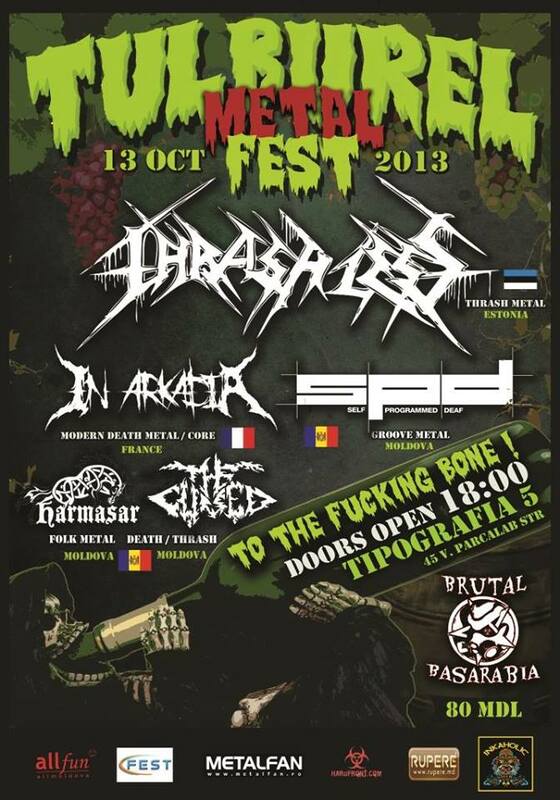 Thrashless brings the furious thrash attack overseas to Finland. A must for fans of Destruction etc. quality old school thrash metal. Tickets 5€. Age limit 18 years. The Thrashless youtube channel now has a video of our track Mirrored Reality from at our very first gig at Tapper.